This new film got some buzz after its trailer was released, with lots of people saying it could be scary as all get-out. That, and there aren’t many movies revolving around haunted artwork and/or the art world, so we thought it could be breaking some new ground. So I tuned in this evening. And I’m glad I had wine in the fridge, after what I just saw. 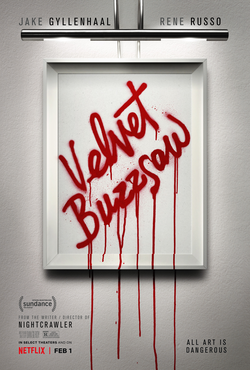 Velvet Buzzsaw follows tough art critic Mort Vandewalt, art agent Josephina, and her boss Rhodora Haze, who are considered the creme de la creme of the art elite circles or working on making that happen. One day, Josephina discovers her elderly neighbor has died, and then discovers he’s an artist of amazing talent, who also wanted all his artwork destroyed after his death. Jospehina decides to take the artwork and sell it alongside Rhodora, making them all very rich. However, several suspicious accidents and deaths occur, all occurring around the dead man’s art. Soon Mort, who has become obsessed with the dead man and his work, discovers some dark secrets around it. Secrets that are deadly in their power. I’ve heard it said that contemporary art is about the idea behind the piece and its execution, rather than what the work portrays. If so, I think the idea here was a searing indictment of the elite art world in the form of a horror movie, but ooh, was the execution horribly botched. Velvet Buzzsaw is only really a horror movie a third of the time. The other two-thirds, it seems to be either a slow-burn thriller about the dark side of the art world, or the film equivalent of those literary stories where characters go on personal journeys through their hundrum lives to find themselves/meaning in their lives/happiness. When it’s the third type, it’s actually pretty decent. If it were that kind of film, then we might get something Oscar-worthy. But then the film switches to slow-burn thriller, which is just kind of sub-par, all talk about cut-rate deals and how to screw everybody over (in more senses than one). And when it switches to horror, the rest of the movie has been so diluted that there’s no atmosphere or scares that the audience can be picked up. I also found John Malkovich’s role in this film to be a total waste. He’s this tortured artist who kind of exits the film halfway through, and then we only see him in the credits, and it’s like…what? What was the point of this character? Along with Natalia Dyer’s Coco, which would’ve been a great perspective to see these events play out from if the character had been given more screen time, I’m just peeved. If there was something about this film I liked, it was the cast. Jake Gyllenhaal, Zawe Ashton and Rene Russo do excellent jobs as the three main characters, Daveed Diggs of Hamilton fame has a role as an up-and-coming artist, which was cool. And there are some cool art pieces in the film, as well as some great bits of cinematography. But taken all together, Velvet Buzzsaw is a 2 out of 5 at best. It’s inconsistent in tone, wastes some of its talent, and ultimately creates a film that’s stylistically memorable but otherwise forgettable. If the film had maybe found a tone to focus on and, if that chosen tone had been horror or horror-thriller, given the character of Coco more screen time instead of just using her as a sort of tragic comic relief, and had devoted time to building an atmosphere, then we might’ve had something here. But since the filmmakers didn’t go that route, it’s just a damn shame. If you’ve been with me for a while now, you know I’m interested in and an admirer of creepypasta, urban legends and scary stories born and spread on the Internet that seem to have some sort of plausibility of truth to them, even if you can’t prove it. Recently I heard about a TV series called Channel Zero that, like American Horror Story and Slasher before it, told a different horror story every season, though in this case the stories were based on creepypasta. I decided to take a look, and found out my local library had all three seasons on DVD. I reserved the first season, subtitled Candle Cove, and picked it up yesterday. Guess who spent most of his Saturday binge-watching it on his TV and laptop? This guy. And as this is me we’re talking about, of course I’m reviewing it. Based on the Candle Cove creepypasta by Kris Straub (unknown if he’s related to horror author and friend of Stephen King Peter Straub), Channel Zero: Candle Cove follows Mike Painter, a child psychiatrist who returns to his childhood home of Iron Hill, Ohio (go Ohio!) after leaving twenty-eight years previously, when five children were horribly murdered and the killer was never caught. One of the children was Mike’s twin brother Eddie. 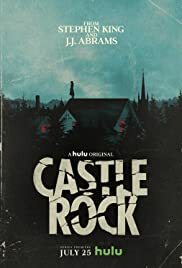 Now back to put old demons to rest, Mike reconnects with old friends and finds out that several children in town have been watching Candle Cove, a mysterious TV series that originally aired during the two months the murders occurred. Its return to TV doesn’t just coincide with Mike’s return, but with a series of events that threatens to rock Iron Hill, Mike, and his family to their very cores. I was very impressed with Channel Zero‘s first season. First off, there’s the story. Candle Cove tells a slow-burn story centered around its unfolding mystery. It’s very hard to look away as you watch the characters try to figure out the mystery of the Candle Cove TV show and how it may have affected events past and present. It’s also extremely twisty, making you question everything and wonder how it’s all connected. Trust me, you won’t see the finale until it happens, and it’ll leave you speechless. I also sympathized with a lot of the characters. They each had their own demons to deal with, and as events start getting crazier and crazier, you can almost find yourself understanding why they do what they do. Doesn’t mean you’ll always approve or root for them, but you’ll understand. Special mention goes to Fiona Shaw (the actress who played Aunt Petunia in the Harry Potter movies) who played Marla Painter, Mike’s mother. That character goes through so much, but is probably the strongest character on the show, and Ms. Shaw carries it with every scene. Loved seeing her on screen every time she showed up. 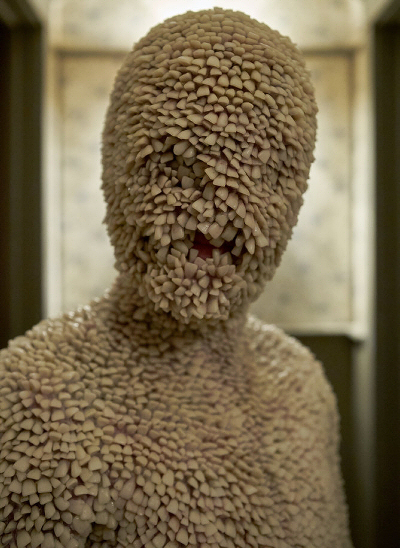 Hello, I’m the Tooth Child. I’ll be in your nightmares tonight. And oh my God, the visuals on this show! From the clips of Candle Cove, to the figures of the Tooth Child and the Skin-Taker, to even some of the dream sequences, there is so much terrifying imagery! Season One definitely took care to make sure every creepy scene was as disturbing as possible. If any of my works ever get adapted, I hope just as much care is put into the visuals and scares. If there are any flaws with season one, at times the story tends to focus more on the slow-burn story than on actually making viewers crap their pants. That’s not a bad thing, but for some horror fans who prefer outright scares, the slow-burn quality may be a bit off-putting. But at the moment, that’s the only issue I can point out with this show. And it’s not even my issue! On a scale of 1 to 5, I’m giving Channel Zero: Candle Cove full marks with a 5 out of 5! Great storytelling with a well thought-out mystery and excellent visuals, it feels like something Stephen King might produce from his own twisted imagination. Tune in, and let yourself be hypnotized. That’s all for now, my Followers of Fear. With September here, there’s a lot of great horror stories on the horizon to read/watch and review. And believe me, I’ll be sharing my thoughts on most of them. Whether you want me to or not. Until next time, pleasant nightmares! 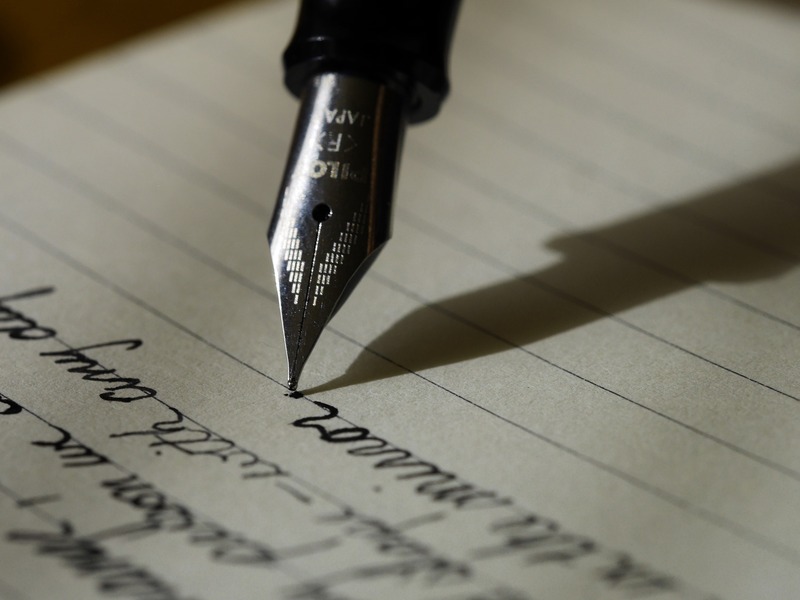 What Makes a Story a Slow Burn? You know, for a little while now, I’ve been pondering something. I’ve heard a lot of people refer to certain stories as “slow burns.” Heck, I even called my friend/colleague Pat Bertram’s book Madame ZeeZee’s Nightmare a slow burn mystery when I reviewed it on Amazon (and I highly recommend you read it, BTW). But what exactly makes a story a “slow burn?” Sadly, searching in Google didn’t pull up a lot of information, and I needed a short break from working on Rose (which is going great, BTW), so I thought I’d share my observations on the matter. So what is a slow burn story? Well, to put it simply, it’s a story that doesn’t try to rush itself or keep escalating things as the story goes on. Instead, the story takes its time getting to the story’s resolution, using an intriguing set up, good characters and character development, and little bumps in the excitement levels to keep readers invested in the story. A good example of a slow burn would be a romance that, instead of having the characters hook up within the first half of the story and then showing them struggle to stay together, or having the characters finally confess and kiss at the end of the story after a number of travails, the story takes its time establishing these characters, the development of their relationship, and then showing the hook up, all without any big drama or too huge plot twists. Getting an idea for them yet? And you’re probably familiar with a lot of these stories, even if you don’t know it. Many of these slow burn stories are pretty calm for up to the first two-thirds, with little intervals during that time that ramp up the excitement for a brief period, before they have an explosive final third (not always but often). A good example of this is The Shining, both the book and the movie. Unlike other King stories like It, where things are big and scary from the very beginning, The Shining takes its time building things up. It lays the groundwork, showing us these very real characters and their struggles, the isolation they feel, and the true nature of the Overlook. On that final one, King really takes his time. We get brief glimpses of the truth of the hotel, and each glimpse gets nastier every time, but it’s not until the final third that things really hit a head and things become truly exciting. Another facet I’ve noticed about slow burns (the ones I’ve come across, anyway) is that there’s a sort of reluctance on the parts of the characters. In The Shining, none of the three main characters want to be in the hotel, but they all have to be so they can survive as a family, and it’s with a certain reluctance that the characters, especially Jack, acknowledge that there’s something seriously wrong with the hotel they can’t handle and that they have to get the hell out of Dodge. Dracula is often described as a slow burn, especially in the novel and in the Nosferatu adaptations, and without a doubt the characters are reluctant to be in the machinations of a centuries-old vampire. And in Pat’s novel Madame ZeeZee, the first-person narrator is very much reluctant at first to look into the strange events that occur at the titular character’s dance studio. It’s only as things progress that she finds herself really looking into things. So that’s slow burns for you. But how do you write them? If I had to guess, I’d think it would have to do with moderation, specifically moderating the amount of excitement in the story. With most other stories, the norm is to build the excitement until the climax of the story when things get really explosive. But with a slow burn, it’s more like you’re doing a mostly flat Richter scale graph with only slight bumps here and there until the very end when things get super exciting (if you decide to write the story that way, that is). Doing that might take some practice, however, so I would recommend doing that practice and just allowing yourself to get good at them. Don’t get upset if you’re not good at it at first; we all start somewhere, don’t we? In the meantime, if you’d like to read some good slow burns to get a good idea for them, here are some of the ones I’d recommend: The Shining by Stephen King; See What I Have Done by Sarah Schmidt (see my review of that novel here); HEX by Thomas Olde Heuvelt (see my review of that here); Final Girls by Riley Sager (see my review for that here); and of course Madame ZeeZee’s Nightmare by Pat Bertram, which I reviewed on Amazon. All of them are excellent slow burns, and I can’t recommend them enough. Definitely check them out if you’re curious. What observations have you made about slow burn stories? Which slow burns have you read recently? Would you recommend them? I’ve been hearing about this film for a few months now, and the earliest whispers I heard was that it was going to be scary. Some event went so far as to call it an instant classic in the horror genre. Well, with rumors like that, I had to see this one myself. So today I went to the theater, trying to go in without preconceived expectations so as to give it a fair rating. God, Hereditary is unsettling. And I’m still not sure what to make of it. 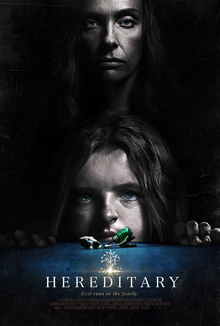 Hereditary follows the Graham family: father Steve, mother Annie, teenage son Peter, and 13-year-old daughter Charlie. The film begins with the funeral of Annie’s mother Ellen Leigh, who had a very complicated relationship to her daughter. What follows is a strange and twisting journey as the family experiences tragedy, psychosis, and the strange, all in two terrifying hours. Where to begin? Well, for one thing, the film is excellent at creating atmosphere. It’s a slow burn story that doesn’t pile on the scary stuff all at once or starts small and then continues to escalate. Instead, it features small instances of horrifying and/or possibly supernatural occurrences, followed by big scary moments that stay with you for ages (one early-ish in the film left my mouth hanging with my hand covering it for several minutes) before retreating back to low levels. It’s a method that I don’t usually see in horror, but it’s quite effective. And when paired with odd camera movements and a soundtrack that’s quiet for nearly half of the film and only utilizes music during the most necessary scenes, the unsettled feeling you get while watching is doubled. And on top of all that, you don’t really know if what’s happening is actually caused by supernatural forces or is taking place in the characters’ heads. Annie admits that her family has a very dark history of mental illness, and it’s hinted that daughter Charlie possibly has some mental/learning disabilities as well. So is what’s happening on screen actually the work of malevolent, supernatural forces, or is it some sort of shared delusion manifeting in a family under stress? Hereditary makes you ask that question throughout the movie, and you may not be able to answer by the end. All these elements come together to create this really freaky atmosphere that where it feels like nothing is stable, and anything can shift under your feet at a moment’s notice. Heck, the camerawork for this film, like sliding one person to the next and then backing up all in one shot or revealing a character’s reaction to a scare before showing us what’s so scary, feels like something right out of The Shining. Actually, one wouldn’t be wrong in calling Hereditary a modern-day Shining, as its ability to unsettle and make audiences question the characters’ sanity, along with the excellent tricks of music and camera, are reminiscent of the Kubrick film. Of course, knowing my feelings on The Shining, it won’t surprise many of you to know I like this film better. Of course, none of this would work so well without a brilliant cast to back it up. There are a number of excellent actors in this film, like Toni Colette as Annie, Alex Wolff as Peter and Gabriel Byrne as Steve, and they all do an amazing job in their roles. But the prize definitely goes to young break-out star Milly Shapiro as Charlie, who embodies the strange, creepy kid almost too well. You watch her, and you can’t help but be mesmerized and afraid. I hope she appears in more horror films (or films in general), because if her performance in Hereditary is anything to go by, she’s going to have quite the career in the future. If there’s one problem the film had, it was the last couple minutes. I mean, they were passable, but I expected more after everything that came before. Other than that, great film. All in all, I think the moniker “instant classic” is an excellent one for Hereditary. On a scale of 1 to 5, I’m giving it a 4.5. An unsettling, gripping addition to the horror pantheon that you won’t be able to disengage from and will stay with you long after the credits roll. Check it out, and be prepared for scares.